The winners of last year’s Rotherham Young Entrepreneur of the Year awards say their businesses have been booming in 2009 - despite the economic gloom. As the closing date for this year’s Young Entrepreneur award draws close, former entrants report order books are full, the opportunities are out there - and people are still hungry for the services of innovative young people. Andy Parton, who won the Best Business Using IT/Technology category for his company Flowed Media Ltd, says he has been so busy, he’s had to stop doing some of the jobs he was routinely taking on in order to focus on his strengths and his business. Andy said: “I got to a stage when I was so busy just trying to get everything done, and saying yes to everything to keep the money coming in, I stopped focusing on the business and the direction it was going. I now concentrate on my core business and not on the less profitable bits. It’s a much more efficient and rewarding way of doing things. 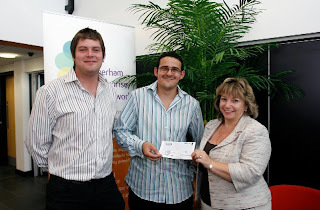 Now he is 30, Andy’s digital solutions business has taken on two members of staff based Fusion Business Centre, run by Rotherham Investment & Development Office (RiDO), the Council’s regeneration arm. And his public sector client portfolio has grown thanks to his niche offering. Flowed uniquely specialises in digital solutions in education for the 14 to 19 age group, developing online tools to make sure teachers have got the right tools for the job. He is also busy developing creative online packages that he believes businesses will need in the future. Andy said: “I’m always coming up with ideas - as well as being able to project manage things. Being one step ahead is key in the online business. Meanwhile last year’s overall winners Josh Abbotts and Gavin Winder at Prototype Creative have also reported a good year’s business. The pair, who run their graphic and web design agency out of another RiDO-run business centre – Century at Manvers – have seen full order books without even trying to get them. Josh said: “We’ve done very little to get more work – it just keeps on coming in from word of mouth. We find often the best way of marketing yourself is by doing a really good job. Back for the fourth year, the awards have consistently uncovered a wealth of young talent that had previously been invisible. 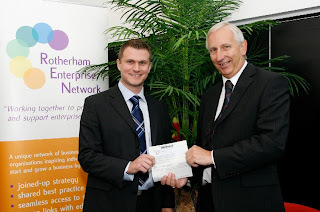 Awards backer Rotherham Enterprise Network (REN) helps ensure through follow-up publicity that they become highly visible, including local, regional and national media coverage. The awards are part of the Rotherham Chamber of Commerce Business Awards, and are sponsored by REN, Rotherham Youth Enterprise (RYE) and Business Link, the Government-funded Solutions for Business and other partners. This year the overall winner will receive £1,000, from award sponsors UK Steel Enterprise, with the four category winners taking home £500 each from the other sponsors, Business Link, Yorkshire Forward and the Barnsley & Rotherham Chamber. Entry forms are available by calling 01709 372099, by visiting your local library, or by going to www.rido.org.uk and following the prompts. All applicants must submit a completed application to the judges by July 17 2009.